HOW TO CHANGE SAND FROM A SAND FILTER. How to change sand from a filter. It is so important to clean your filter sand or just simply replace it. Filtration is very important to keep water clean and healthy. I have found that everyone has its own way of cleaning the sand filter but it all comes down to one thing...get the sand out, wash the filter without breaking filter fingers, pipes ect. Put the multi port valve on close. Make sure the main electrical switch is off. You don't want a accident do you? Then open the lid of the filter the same way as you would put a spare wheel on your car. Criss cross. Then put the screws back into holes. If sand gets into those grooves your will battle to get the screws in again. Put a plastic bag or cup over the top cowl. Then start digging the sand out. Make sure you get everything out and try not do damage the filter fingers at the bottom. You will also see a bleeder pipe (thin white pipe) that relieves the pressure from the top PVC pipe and the bottom one. Make sure that this pipe stays intacked. If anything seems loose or doesn't look right, just replace it. Better to do it while the sand is out than when you already filled it and find that there is a problem and you have to start all over again. After all the sand is out, fill the filter halfway with water ( to make sure when you put the sand in that the fingers don't break). Then fill it with good quality silica sand up to just above the top PVC pipe. Don't put too much or too little sand in. If there is too much sand in, the filter will not filter properly and it will seem as if there is a blockage in the system. 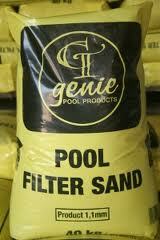 If there is too little sand in, it will push back into the pool and you will have no filtration. Make sure the bleeder pipe sticks out on the top, wash to filter off with clean water to get sand off the screws. Don't forget to take the plastic bag of the cowl. Put the lid back ( spare wheel way). Switch the electricity on again. Put the multi port valve on back wash and switch the pump on. Give it a good 3 to 4 times back wash and rinse to get all the dust out of the filter and sand. Put the multi port on filter mode and there you have it. Clean sand in the filter with much better filtration. Remember that there is always a few things that can go wrong and break and i will advice you to phone a Elene's Pools close to you to ask for assistance. We have been in the swimming pool industry for more than 20 years and will be able to assist you in every way. Let us know if you need help. We will always be at your service. My next blog will be about pool safety. Don't miss it!! I will give you great tips on how to keep your family safe.